About 11 percent of all traffic accidents that occur each year on U.S. roadways are motorcycle accidents. Motorcycle riders are about 35 times more likely than occupants of passenger vehicles (or other vehicles) to be involved in fatal traffic accidents. Should consult with an experienced lawyer to get their case started. Is here to aggressively defend your rights. 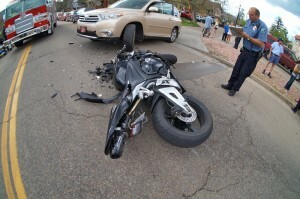 Has more than 35 years of experience helping motorcycle accident victims secure the compensation they need and deserve. In addition to offering free initial consults and contingency fee options, our lawyer makes hospital visits to ensure that you have access to the legal support you need – whenever and wherever you need it. To learn more about your rights and receive a thorough, professional evaluation of your case for free, call us at 303-499-0449 or email us using the form at the left-hand side of the screen.